The game of Table Tennis, which was once a dominant factor in the Ancient County, is set to return to the fore as one of the premiere sport there. The Guyana Table Tennis Association (GTTA) under the stewardship of Commissioner of Police Henry Green is making all efforts to spread the game to all corners of the country. The Ancient County with its rich history of table tennis and its past champion is taking the lead in accepting the challenge. Member of the head table (from left) Lindon Johnson, Floyd Conway, Dr Pradeep Balram and Patrick Triumph at the meeting. 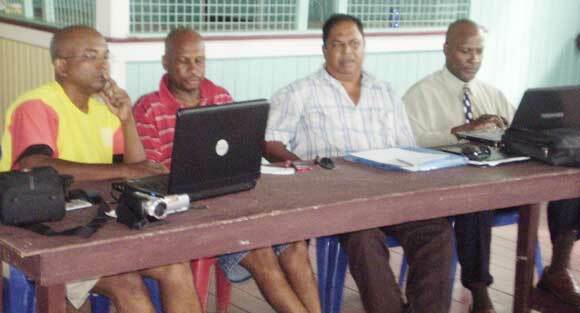 A meeting was held between representatives from the GTTA and representatives from Berbice on Saturday at the Rose Hall Community Centre in East Canje to sort out plans to resuscitate the game in Berbice, plan for the establishment of the Berbice sub-association and make plans for a Berbice Pre-Mashramani tournament, which is slated for Wednesday February 16 at the Port Mourant Training School. Discussions were fruitful and if what came out of the meeting is something to judge from then the game is set for a bright future. Representing the GTTA were vice president Dr Pradeep Balram who chaired the meeting, Assistant General Secretary and National Table Tennis Coach Linden Johnson and former National Player and PRO Patrick Triumph. Berbice representatives on the national body Floyd Conway, Gibran Hussein and Former national female champion Desiree Lancaster were in attendance. Other prominent persons in attendance were former Mayor and prominent businessman and sport Administrator Errol Alphonso, Superintendent of Police and Commandant of the Felix Austin Police College in Berbice, Ian Amsterdam and Assistant Superintendent Conrad Albert. 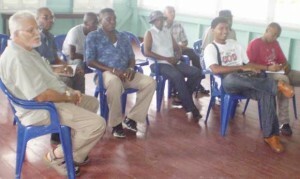 An interim body was put together to over see activities and chart the way forward and plan for the tournament at the Guysuco Training School in Port Mourant, which incidentally and fittingly is the birth place and home village of Anand Sookram who was the first Guyanese male to win a Caribbean table Tennis title, which was achieved at the junior level in 1965. The tournament will be played in three categories U13, U18 and Open and is open to Berbicians only, both male and female. Some of the attendees at the meeting. Desiree Lancaster is fifth left, Errol Alphonso is at left, Supt Amsterdam is second left. Outstanding performers will be selected to participate in the Mashramani tournament later in the month in Georgetown. 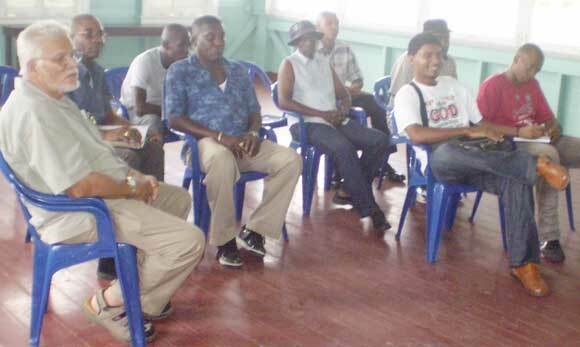 The body is headed by Floyd Conway of Guysuco and comprised of Gibran Hussein of Corriverton, Desiree Lancaster, Superintendent Ian Amsterdam, Sergeant Jairam Ramlakhan of the Central Police Station, Brentnol Richards of Guysuco, Levan Buchey , with Errol Alphonso assisting in an Advisory capacity and Samuel Whyte assisting with Public Relations. Most of the equipment including tables and balls will be supplied by The GTTA. The parent body is also making moves to have rubbers and other tennis equipment available as early as possible at a reduce cost. The parent body along with their Berbice counterparts will be looking after the other logistics including transportation, water, refreshment, letters to the relevant authorities including schools etc. The GTTA is also to organise training seminars for persons interested in becoming officials that will be done in Berbice before the tournament. Commissioner of Police, Henry Green, is expected to be at the launching of the Berbice tournament, while it was also decided to invite other prominent personals including the Minister of Sports, the Regional Chairman of Region 6 and the Mayors of the respective towns in Berbice. Apart from Anand Sookram, other Caribbean champion who hailed from the Ancient County was Doreen Chow Wah, who was from Canje and won the Caribbean woman’s title in 1970 in Barbados. Former national Female Table Tennis Queen and nine times champion Desiree Lancaster, who incidentally is the only female to have won the tournament on five consecutive occasions. Donna Sue was also a former national champion; the last female national champion to have emerged from Berbice was Vida Moore a few years ago. Former national junior player Petal Bennet also won the Caribbean junior doubles title in the 90s. Isaac Sewnarine, the late Roy Fredericks, Leslie Amsterdam, Alvin Kallicharran, Clairmont Saul, the Duffs Siblings and the Alphonsos among others were also involved in the sport at the highest level.